Kathy Mitchell O'Neal joined the Hawken community in 2018 after serving 13 years as the Director of Enrollment Management at University Prep in Seattle, WA. She has worked in independent schools for more than 20 years and was drawn to Hawken for its innovation in education and commitment to building character and intellect. Kathy is a founder of the Puget Sound Independent Schools admission consortium and Seattle’s annual Independent School Fair for People of Color, now in its 11th year. For seven years Kathy served on the National Association of Independent Schools (NAIS) Call to Action, a national think tank and advisory council on diversity in independent schools. Currently she serves on the Educational Records Bureau in New York City. A Seattle native and a proud mother of three children, Ayana (23), Coryn (21) and Elijah (17), Kathy enjoys spending time with family and friends, cooking, hiking and listening to live music. Maggie joined Hawken in 2018 from a position abroad, where she served as Dean of Teaching and Learning at an international school. Prior to her work abroad, Maggie worked in college admissions in the Midwest for nearly a decade and received her Master’s Degree in Education. The third generation of women in her family to believe and work in Progressive Education, Maggie was drawn to Hawken for its history of whole-child education, its dedication to character development, and its promise to value and grow students who go out into the world and do good things. When not at Hawken, Maggie works on projects with her husband, a professional fine art photographer, and spends time with her son. Susan Newman joined the Hawken community in 2006, having previously taught and coached at independent schools in Ohio and Connecticut. Her early experience as an AmeriCorps volunteer and working with the Upward Bound program at Northfield Mount Hermon (MA) influenced her interest in providing financial accessibility to education for all families. When not in the admission office, Susan can often be found cheering on the Hawks at various athletic events or volunteering as a puppy raiser with Guiding Eyes for the Blind. Laura Lewis has worked at Hawken since 1998. She brings her knowledge of Hawken School and background in marketing and communications to the Admission Office as she helps families through the admission process. She is the mother of two Hawken students. In her spare time, she plays fiddle with her Appalachian string band “Mr. Haney” and also enjoys producing folk music events. Mike comes to Hawken after working as an NFLPA Certified Agent where he represented some of the NFL’s brightest stars. Prior to his NFL experience he spent 8 years in the US Air Force after graduating from Baldwin Wallace College and playing a short time for the Miami Dolphins. Mike worked in admissions at Baldwin Wallace and has worked with students in the military as well as at the college level. He holds degrees from Baldwin Wallace College, Cleveland State University and a JD from the Cleveland Marshall College of Law. Mike also serves as the defensive coordinator for Hawken’s football team and is the assistant track coach for Hawken. Mike was drawn to Hawken’s community and mission of developing students’ character and intellect, and has a son in the Lower School. Hayley Rivchun joined the Hawken community and admission team in December 2016. She was previously the children’s programming and camp director at a local community center. Hayley spends her free time with her husband, daughter, family and friends, and loves country concerts, exercising, being out in nature, eating good food, Cleveland sporting events and shopping! Karen entered the humanities classroom at Hawken in 2008 and taught in both the Lower and Middle School. After a 15 year teaching career that included two other independent schools, Karen moved to the Admission Office in 2012. Here she enjoys sharing the Hawken story with prospective families and using her lens as an educator to articulate not only the academic excellence of Hawken but also the strength of its community and the opportunities for students to find and be their “better selves.” Karen’s husband Jim is Hawken’s athletic director, and she has a son and daughter at Hawken. The Doyle family enjoys attending Hawken events, cooking, gardening and summers at the Jersey Shore. Brooke joined the faculty of Hawken School in 2005 after teaching in Massachusetts, where she received her Master’s Degree in Early Childhood Education. 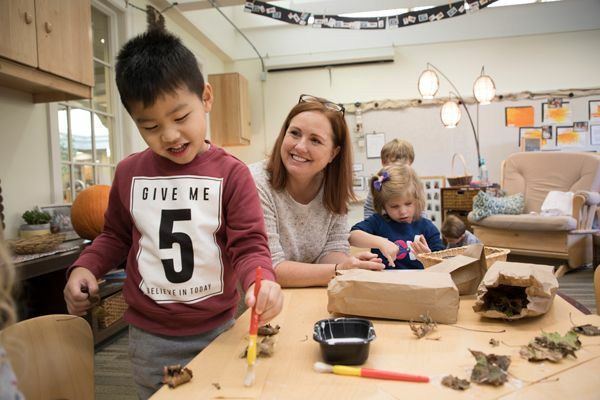 Having grown up in the Cleveland area, she was eager to return and was thrilled to be offered a teaching position in Hawken’s preschool, where she has taught for 11 years until recently joining the Admissions Team. Early Childhood is truly Brooke’s passion as she feels that it embodies the art of teaching, and she is grateful to be able to continue supporting the Early Childhood Program in her new capacity. When not at Hawken School, Brooke enjoys spending time with her family. Joy Desmond is the admission assistant for Hawken’s Lyndhurst campus, where she helps facilitate the application process, admission events and school tours. She has held positions in marketing, advertising and public relations in various industries including publishing and technology. She joined the Lyndhurst admission team in 2014.